Fathers Reading Every Day (FRED) is a simple, effective and sustainable intervention that gets dads reading to their children. We have piloted it in UK primary schools and early years settings and have shown that it can dramatically improve children’s outcomes (see below for more details). We train schools, early years settings, libraries and others in how to engage effectively with dads, and how to run the FRED programme. Practitioners who have received our training, and the FRED resources, can then run FRED as often, and with as many dads and children, as they like. Why is engaging fathers so important? There’s good evidence that children from less well-off backgrounds – and boys especially – are falling behind in their reading (that’s why the Fatherhood Institute supports Read On.Get On, a nationwide campaign which aims to give children more life chances by improving their reading). It’s also the case that dads read less with their children than mums do. Early years settings and schools are increasingly aware of this, and of the importance of engaging fathers and father figures in their children’s learning and development. Conversely, low interest by fathers in their children’s education (particularly boys) has a stronger negative impact on their achievement than contact with the police, poverty, family type, social class, housing tenure and child’s personality. Where early years settings and schools are pro-active in their approach to engaging fathers they see a significant increase in the numbers of fathers involved in the life of the setting/school – both in supporting children’s learning and in governance. Settings which engage fathers in specific support to children with low levels of attainment have seen substantive improvements in children’s learning. Research tells us that fathers – and mothers – want engagement with their children’s learning and education. Children want this too. Devise strategies to create father-inclusive learning environments. Effective engagement strategies for different communities of fathers. We also train you on how to deliver FRED. For a useful summary about FRED, read this article by Children and Young People Now: Dads’ reading programme boosts children’s literacy and numeracy. 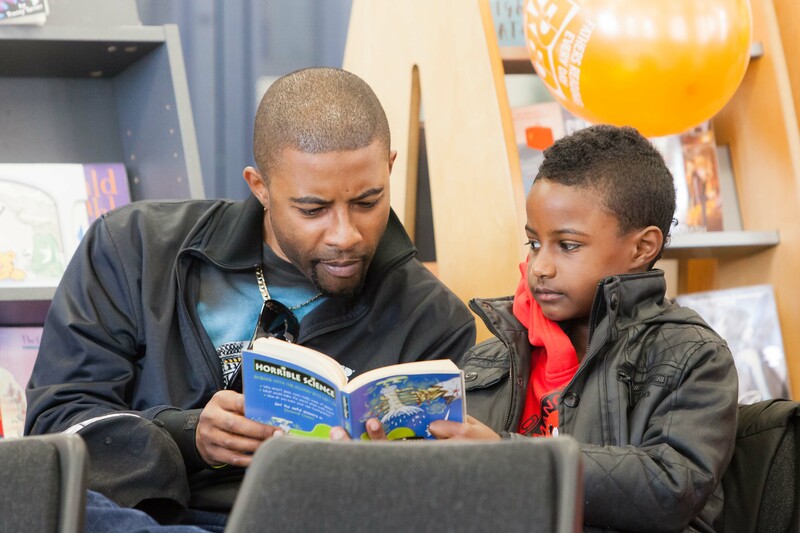 Fathers Reading Every Day is a reading-for-pleasure programme developed in the US and now available to be delivered in the UK via a ‘train the trainer’ model provided by the Fatherhood Institute. In the FRED programme, fathers spend 15 minutes a day for two weeks, reading with their children – then 30 minutes a day for a second two weeks. Each father documents the amount of time spent reading to their children and the number of books read. At the end the school or other family learning setting holds an event to celebrate all the great work the dads and children have been doing. FRED in the US has been shown to improve children’s reading accuracy, comprehension and rate of reading; their writing; and their behaviour. It can also improve attainment in maths – and acts as a great ‘way in’ to establishing wider engagement with fathers. Although FRED is a four week programme we expect it to instil new reading habits that can last for the child’s primary school life and beyond. Watch dads who’ve participated in FRED, talking about the benefits. Read an independent evaluation of our early FRED primary school pilots (2011-13). Read an evaluation of our early years pilots (2013-15): FRED DFE evaluation. Our training is designed to work for staff and volunteers who work, or plan to work, directly with fathers in early years settings and schools. These could include early years practitioners, teachers, teaching/learning assistants, mentors, family learning teams, community education staff, school nurses, counsellors and/or volunteer dads (or mums). We deliver in a venue of your choice; often schools and children’s centres form a cluster to share costs. We sometimes run regionally-organised courses, which allow you to book individual places rather than having to commission a whole course for your local area. All participants receive relevant course materials, including PDF resources needed to run FRED. Read our case studies from Jubilee Primary School and Livity School. For more information and to receive a quote tailored to your needs, contact Jeszemma Garratt on tel 0791 786 4130 or email j.garratt@fatherhoodinstitute.org. We’d love to be able to offer FRED to all schools and early years centres, but unfortunately we are a tiny charity and need to cover our costs. School and local authority budgets are tight. If you’d like to donate some money to help us bring FRED to more dads and their children, please consider supporting us with a donation.